Kenya Corruption: Demonstrators wear mock prison outfits to show that they want to imprison those engaged in corruption, in Nairobi, Kenya, Nov. 3, 2016. An anti-corruption protest turned violent Thursday in Kenya’s capital, with police caught on video beating at least one journalist and one protester, and others alleging they too were attacked. 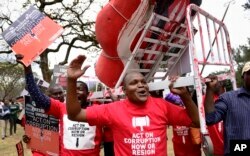 Carrying signs with messages like “Fight Corruption Not Activists,” and wearing T-shirts saying, “Act on Corruption Now or Resign,” hundreds of protesters gathered in Nairobi’s Uhuru Park to voice their anger at what they say are increasing levels of corruption in President Uhuru Kenyatta’s government. Early in the demonstration, police began firing tear gas to disperse protesters. VOA cameraman Amos Wangwa filmed freelance journalist Derrick Davis being beaten by police officers with batons. VOA video also shows a protester being beaten, and others allege they were similarly attacked by police. The protests were sparked by an alleged scandal at the Ministry of Health, where some $300 million in funds were said to have been misappropriated. Kenya Corruption: Demonstrators carry a mock hospital bed covered in fake blood to illustrate the slogan that Kenyans are bleeding due to poor hospital services caused by corruption, in Nairobi, Kenya Thursday, Nov. 3, 2016. Protest organizer and civil rights activist Boniface Mwangi said enough is enough. Deputy police spokesperson Jared Ojuok told VOA he could not make a statement on the beatings at this time. On Transparency International’s corruption index, Kenya ranks 139th out of 168 countries, meaning it is one of the countries where public perception of corruption is highest.